I'm under super tight deadlines with about 5 different projects right now, but I felt like I had been neglecting the blog (it's been like 3 months!) so I thought I would drop in and show some of what I've been up to. 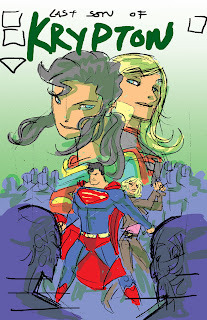 Here is the process of how I put together the cover for issue 59 of Pendant Audio's Last Son of Krypton drama. After I read the script I grabbed the closest graphite pencil and roughly sketched out what I thought would be a cool cover. I even through in a quick color guide to help establish the mood. 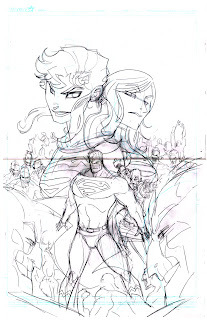 After the thumb was approved I broke out a piece of 11x17 blue line bristol and started to pencil the page. 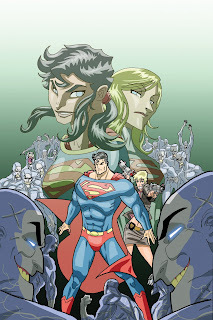 From there I inked the lines with micron pens then scanned the art and did the colors on photoshop Cs3. I try to stick with simple cell shades and push the contrast to create a dramatic piece. And there u have it! Now I gotta get back to work!